James Blane was among the Crackenedge goal scorers in their 3-0 win over Royston Cross last Saturday. Crackenedge are two points clear at the top of Wakefield League Premier Division after they racked up a ninth win of the season, defeating Royston Cross 3-0 last Saturday. Crackenedge bounced back from the previous week’s Brook Butler Cup defeat to Hartshead as goals from James Blane, Macauley Parkinson and Jordan Ledgard secured victory. They are two points clear of Crofton Sports and have four games in hand on their nearest challengers after the league table was altered following the withdrawal of a side. Crackenedge visit neighbours Fox and Hounds in the West Riding County Trophy this Saturday. Fox and Hounds warmed up for the first of two cup derbies between the sides — with them paired together in the League Cup at the end of February — as they earned a 3-0 win away to Snydale Athletic. Fox and Hounds led 2-0 at half-time following a brace from Jack Armitage. One of the goals was set up by Luke Newsome, with the other coming from the penalty spot. Newsome was again on hand to assist Thomas Ramsden with the third goal to seal victory in a game which saw Ryan Lee named man-of-the-match. 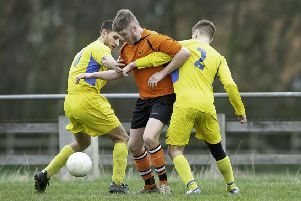 Overthorpe Sports bowed out of the Premier Division Cup as they suffered an 8-3 defeat at home to Beechwood Santos. Stephen Cooper led the way with a hat-trick, Macauley Milburn bagged a brace, with Liam Gales, Ryan Harwood and Chris Minshall also on target. Overthorpe Sports slipped to a 4-2 defeat away to FC Broadway in the battle of the bottom two sides in Division Two. The home side scored twice in each half through Joseph Emsley, Josh Fenwick, Stephen Patterson and Bradley Purnall to secure victory. Thornhill United are fifth after they earned a 4-2 win at home to Snydale Athletic Reserves with Ashley Edmondson, Ryan Pickup, Robert Spiers and Christopher Wilcock the goal scorers. Second division leaders Howden Clough were not in action last week but they remain five points clear of Great Preston ahead of Saturday’s crunch top of the table clash away at Berry Lane.